Whether you've been looking to get into the History Channel's series Vikings or you're already a devoted fan, stop by io9 tonight at 10pm 11pm PT, when actor George Blagden will be live-blogging tonight's episode! And if you aren't watching Vikings, what are you waiting for? 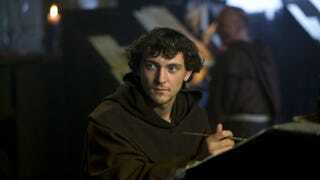 Hey folks: Blagden will be live blogging at this link. Unfortunately, it seems there was some confusion about the air time, so Blagden will start live blogging at 11pm.